This Coconut French Toast is an easy breakfast that’s served with an addictively delicious and creamy coconut syrup made with butter, buttermilk, sugar, and coconut extract! When I saw coconut french toast on the menu at our local breakfast joint, I had to order it and I was instantly in love! But how could it not be, I absolutely adore coconut and breakfast, so combining the two seemed only natural. I knew it was a dish I could easily make at home and, so here we are. This dish is unbelievably light considering that it was in fact, french toast. 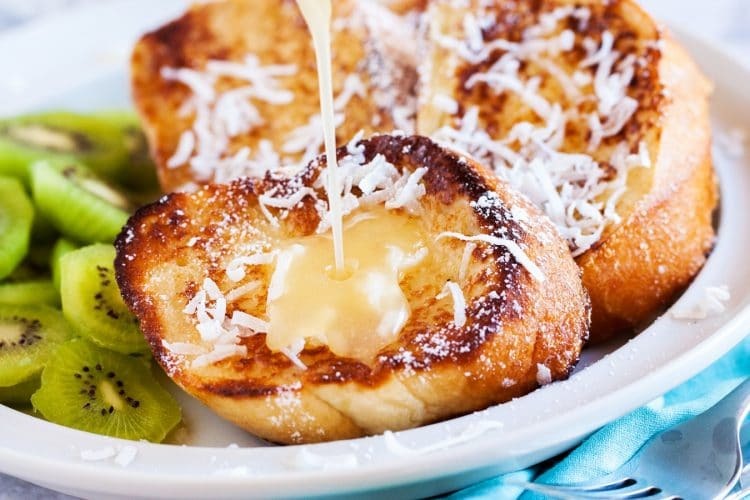 This Coconut French Toast is made with french bread that’s browned to perfection and topped with the most unbelievably delicious homemade coconut syrup and shredded coconut. You can serve this with fresh fruit or alone, either way, it’s a super yummy breakfast you’ll want to make a regular part of your menu planning! 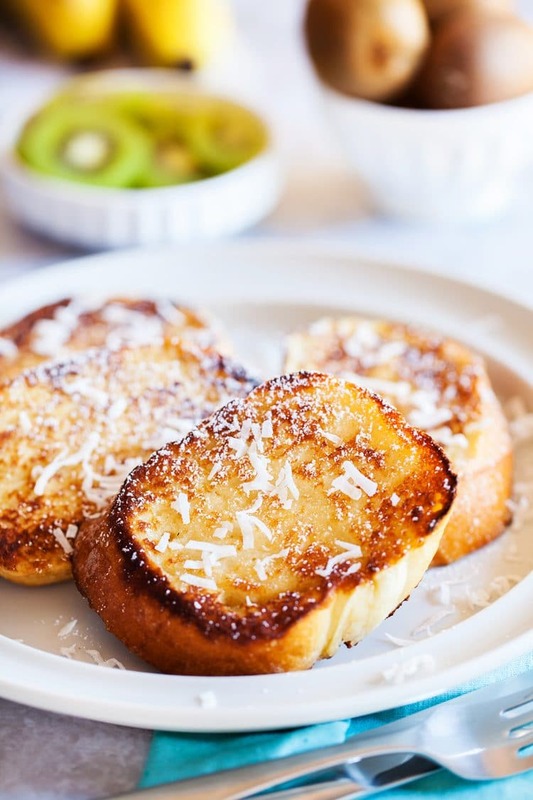 This Easy Coconut French Toast is such a delightful breakfast dish and if you want even more delicious flavor, I recommend swapping out the whole milk for coconut milk but don’t make a special trip just to the store to get it. As long as you serve it with the homemade coconut syrup, you’re golden! Place eggs, milk, flour, vanilla, and salt in a medium-sized bowl and whisk together until mixture is lump free and well blended. Take each slice of bread and dip each side in the mixture to give it a good coat. Place bread slice in greased pan or griddle over medium heat, once it’s got that great brown french toast color flip to cook the other side. Plate and sprinkle with shredded coconut and top with coconut syrup. 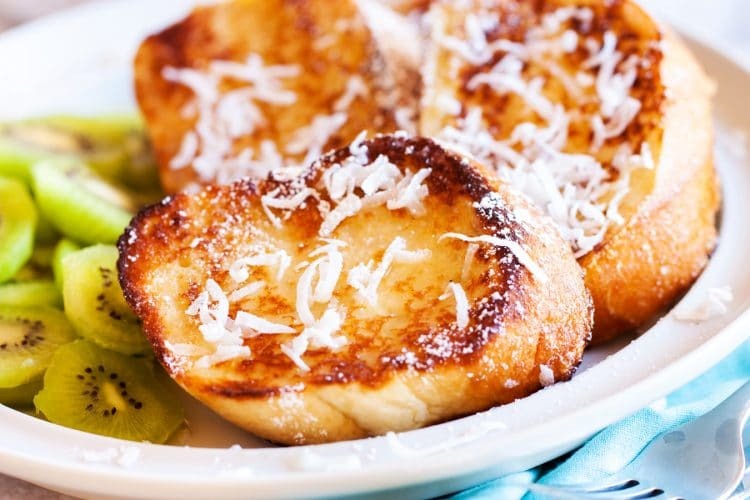 Pin this Coconut French Toast Recipe for Later! This post was originally published on January 12, 2013, and was updated with new photos on March 24, 2017. 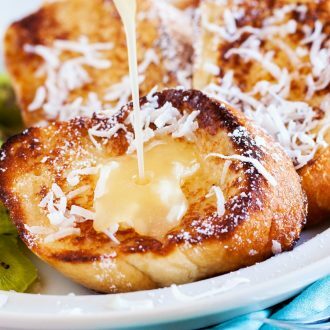 This Coconut French Toast is an easy breakfast that's served with an addictively delicious and creamy coconut syrup made with butter, buttermilk, sugar, and coconut extract! Add the butter, buttermilk, and sugar to a medium/large saucepan and stir to combine. Stir occasionally over medium heat until butter melts and sugar dissolves. Bring to a boil and boil one minute. Remove from heat and add in the baking soda and coconut extract, stirring constantly. Continue to stir syrup and let it sit for a few minutes before serving. The syrup will bubble up, so make sure to use a rather large pot to avoid spillover or make sure to do this over the sink just in case. Slightly Adapted from Cooking a la Mode.